Thanks guys for your feedback and backing me up! Steve - apology accepted, thanks. I'd like to explain where the word "Again" came from (UI issue with Properties panels) but I rather create a separate topic for that with a corresponding bug report. you can only get to it if you have internet access...so it becomes a necessary additional cost for him. Yes, I miss offline html help (and context sensitive for that matter) too for LW. My 3D workstations are usually offline. Wow! Who'd have thought this thread would turn into 5 pages of debate? Can't wait to see what happens when "Rainbows?" subject pops up. If you're so curious why not create this thread and see? 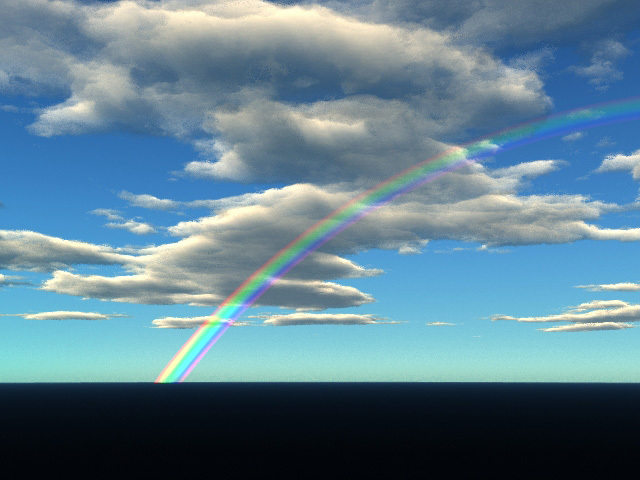 The only plugin I know of that could do Rainbows, that was the old NaturefX plugin, which also did nice oceans, and it also had a way of using polygon shape to design clouds, that is all gone now for the Lightwave platform anyway...And the ogo taiki plugin, also not possible to use with 64 bit 2018, and the devolopment seem to be no more on that plugin. I still await for that Full Global sky tool that can do both atmosphere with fog, haze, turbidy, glow...and infinite volumetric clouds. Ozone plugin...never liked it because it misses so many things from the main application, and some quirks when used with lightwave, I am not sure if it had the option of rainbows, though I am pretty sure the main app did it. Results could of course be great with this Ozone plugin, but obtouse as I am..I rarely jump in to something that doesn´t provide almost full potential. Below sample..Lightwave 11 and ozone 6, I have been waiting so long for ozone to improve..but each new version seem to have very little new improvements...and the status of how a new ozone version will work with 2018, I do not know. Last edited by prometheus; 06-03-2018 at 07:23 AM. After everything they put owners through in last couple years, I'm pretty much done with E-On Software. Shame too, as CarbonScatter is still among best at distribution-instancing I've seen. Ozone's a bit of a money-sink for a couple years now, alas, very little added mostly paying for OS/pkg compatibility. Certainly not enough work done to justify upgrade costs, IMO. They also pulled some nastiness to maintenance subscribers when they went dark, claiming maintenance didn't include upgrades, etc. Last edited by jwiede; 06-03-2018 at 01:40 PM. Carbon Scatter and Ozone have been discontinued last year unfortunately. Yeah, "anyone whose maintenance was active as of June 2017" my hiney. As if most rational customers continued paying maintenance after receiving nothing in return for 2016 maintenance subscriptions. Riiiiiiight. Last edited by jwiede; 06-03-2018 at 02:02 PM. I would but I'm still working on unicorns. however VUE has 150 preset clouds, depends on the time you have available. Last edited by erikals; 06-04-2018 at 03:03 AM. Vue Esprit is the low end version that has serious limitations and almost everything needs to be bought as addon (Animation, Nodes, Ecosystem, Weather effects, Export etc.). It is also limited in CPU cores, output resolution, library etc. Believe me, for Vue you will need as many cores as possible (even for good stills, your render will take long with 12 cores, not to think of animations), as far as I remember Esprit is limited to 2 cores. Backplates require high resolution output. If you want to composite the output you want to use EXR which is only available in Infinite and xStream as far as I know. The same for camera sync. I wouldn't be surprised if there are limitations in the quality settings, shading and lighting models. Note that there is no upgrade path from the Hobbyists line of products to the Professional packages. Best features for the money you will get from Houdini but the landscape tools are still limited and the learning curve is steep. My advice: get Vue Infinite or xStream (but LW2018 is not supported) or get Terragen Professional. But all depends on your requirements of course. Note also that all communication with e-on is via mail and there are no online services (no download page to get updates or licenses, no online store, no forum, no bug tracker) since half a year now. Last edited by Marander; 06-04-2018 at 05:27 AM. Yeah, I’m done with this software and still have to get the royalties that were pending on cornucopia3d when they shut it down. I will certainly fall for Terragen in the future, though. So if you only want nice looking background skies ok, but for good looking and custom clouds you would also require the Nodes / Functions addon. Last edited by Marander; 06-04-2018 at 08:24 AM. I think he is taking into account how much it costs him per month for internet access, $80 if I read him correctly, which adds $960 to the cost if that is the only reason he needs/uses the internet.. As the documentation is only available online, no hard copy or downloadable manuals, you can only get to it if you have internet access...so it becomes a necessary additional cost for him. I'm still not sure I understand his point; I mean, not to be rude or anything, but how much did he just spend on posting here? Or, stated another way, is he saying that if he didn't have LW, he wouldn't have internet access? Hmmmm.